UiPath has scored a massive funding round that could accelerate the progress of one of the most interesting modern IT phenomena, robotic process automation (RPA). As I wrote about an earlier, more modest round for this company with roots in Romania, RPA automates humdrum, clerical tasks including employee on-boarding, insurance claims, credit card replacement authorizations, loan applications and much, much more. On 18 September, UiPath announced it had pulled in $225m from VC luminaries including Sequoia and Accel, adding to the $153m it collected in its series B round just six months ago and $30m Series A, underlining its position as an early leader in RPA, alongside the likes of UK firm Blue Prism, which has soared in value since its 2016 IPO. The UiPath Series C round is notable beyond the large sum involved. It also multiples the valuation of the company to $3bn from $1.1bn at the time of the Series B announcement. UiPath has also revealed revenue hyper-growth from $1m to $100m in less than 21 months. That hockey-stick-shaped upward trending allows it to join the elite cadre that have described themselves as the fastest-growing enterprise subscription software companies in history. 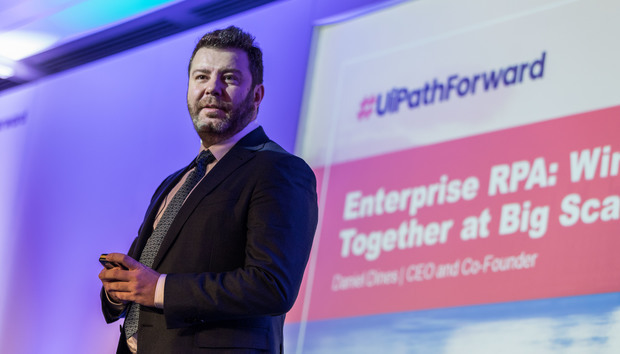 To mark the occasion of the funding, I swapped emails with UiPath CEO Daniel Dines and the following is a lightly edited version of our exchange.